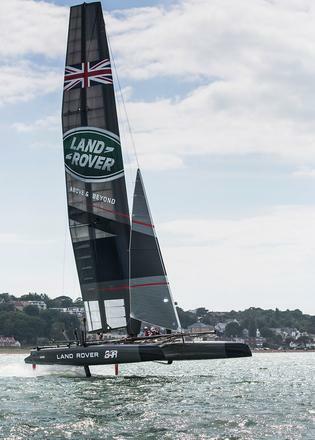 Land Rover technology is being used to develop the boat that will be used by Land Rover BAR in its challenge for the 35th America’s Cup in 2017. With just 11 months until the launch of Land Rover BAR’s AC50 catamaran, Jaguar Land Rover has revealed the key technical areas where expertise is being applied to the Land Rover BAR boat development. The 15 metre AC50 foiling catamaran, which is shrouded in secrecy, has been code named R1. The collaboration between Jaguar Land Rover and Ben Ainslie Racing was formed last year, with the two joining forces to help bring the America’s Cup back to Britain. The Land Rover advanced engineering team has been working alongside the designers and engineers from Land Rover BAR to develop a series of prototype test boats. The results will help to develop the boat that will be used in the challenge for the 35th America’s Cup. “Since the birth of foiling, one of the biggest challenges is understanding how to control these massively powerful machines whilst balancing on a comparatively small surface area,” said Tony Harper, head of research at Jaguar Land Rover. The six America’s Cup teams are currently preparing for the Louis Vuitton America’s Cup World Series in Oman (February 27-28). The Oman event is the fourth in a series of races in which the teams race identical AC45’s in a bid to gain points towards the America’s Cup Qualifiers.